Hope you’re all doing great! We just got home from our trip to Japan—Osaka to be specific, and we visited some new places that you might be interested in if you’re looking for experiences other than culinary and shopping. 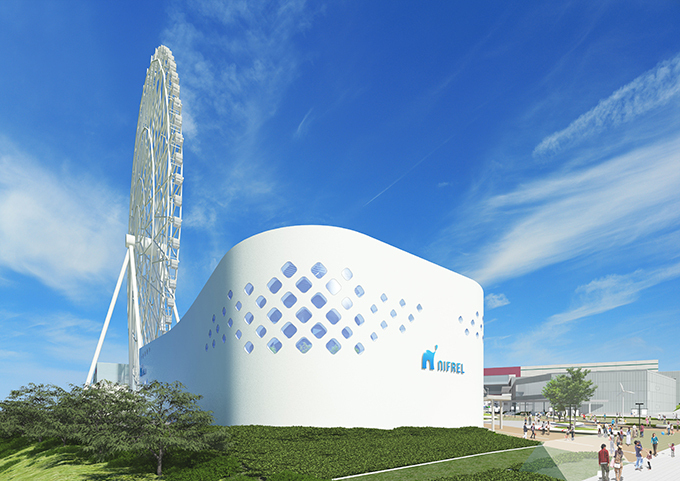 The first two highlights would be our joyous visits to Universal Studios Japan (USJ) and Harukas 300 Observatory. 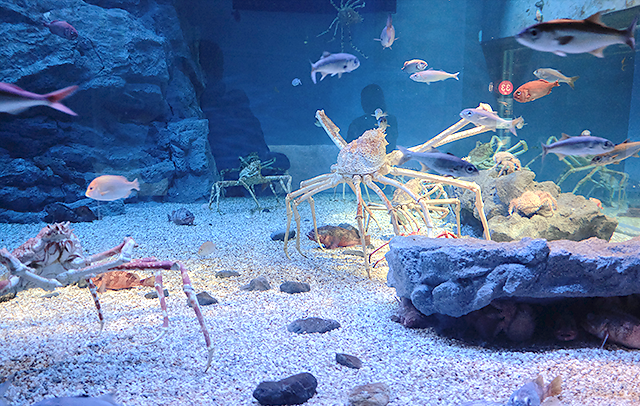 And the next two places we will discuss in depth are Nifrel Zoo and Kaiyukan Aquarium, where things would get a bit, well, maybe A LOT darker, despite all the fun and beautiful sides of it. 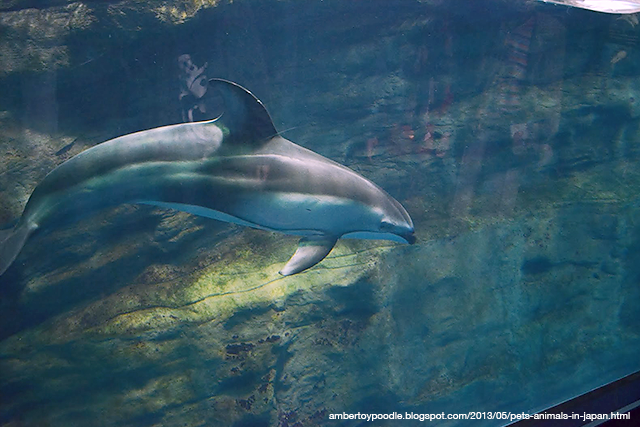 If you’re not up for a disturbing topic of animals in captivity, then we suggest that you skip reading our review about these places. First stop! 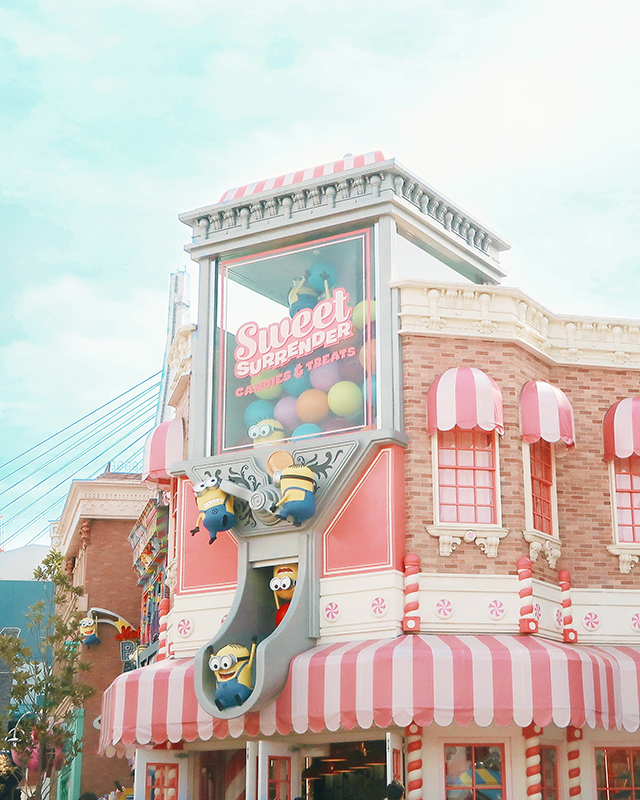 Universal Studios Japan is a fun, family-friendly theme park where you can enjoy thrilling rides like The Flying Dinosaur (highly recommended), immerse yourself in the Wizarding World of Harry Potter, unleash your inner sailor scout at the Sailor Moon anime attraction, get entertained by the 4D shows, stage shows, and even street shows — all that while taking beautiful pictures around the park! 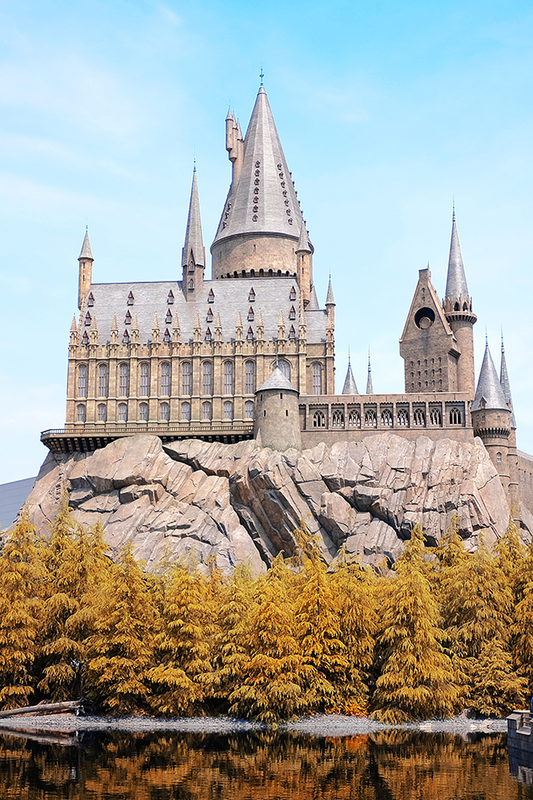 Stunning castle at The Wizarding World of Harry Potter area. 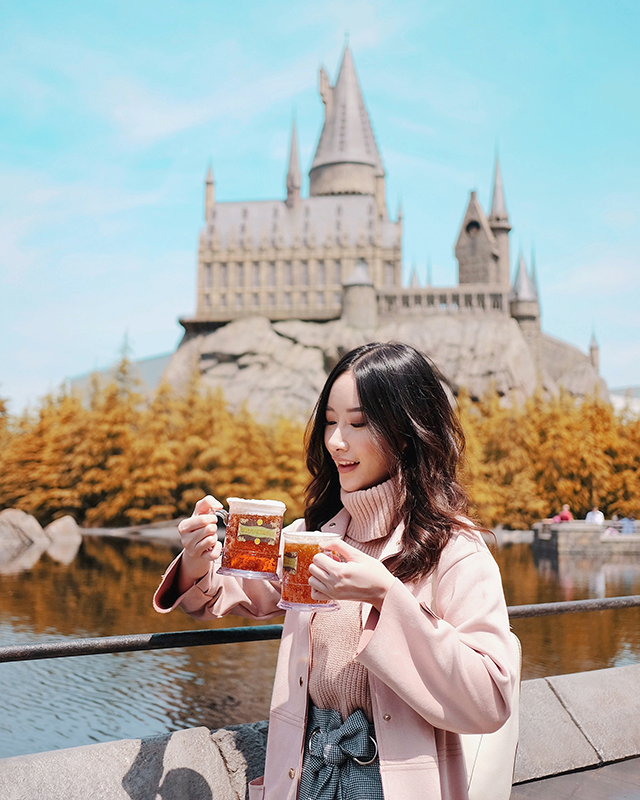 Finally tried the famous Butter Beer! 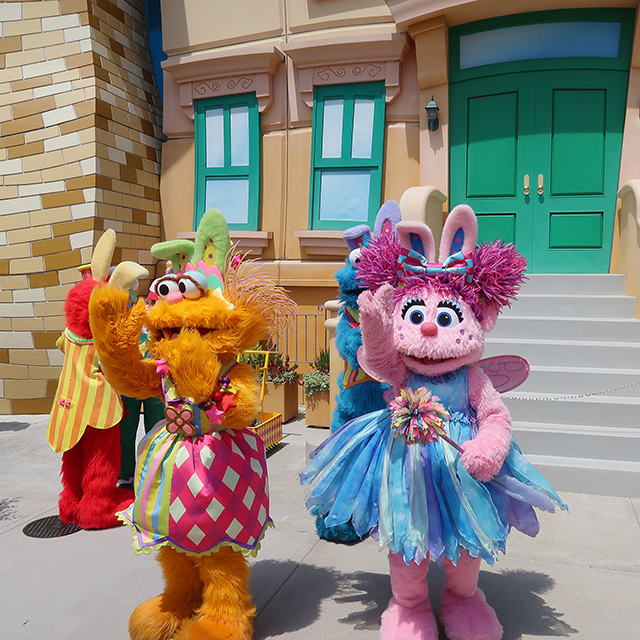 You can also meet up with the whole gang of Sesame Street and watch their rhythmic performance here. 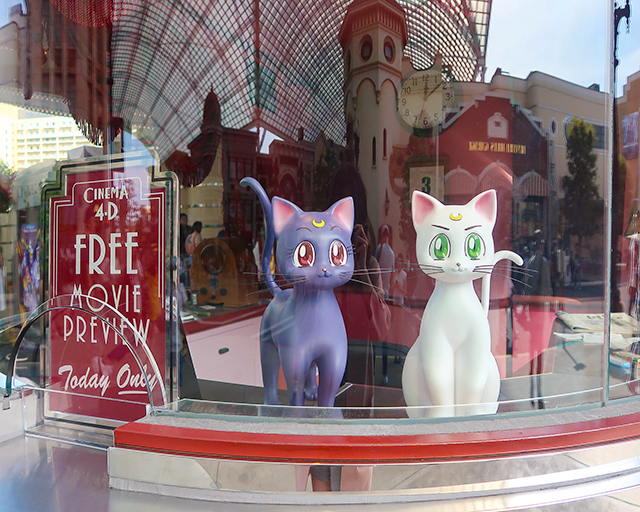 The main attraction at this area is a 4D show where they play a Sailor Moon short movie. We hope they will add English subtitles when we go back though. 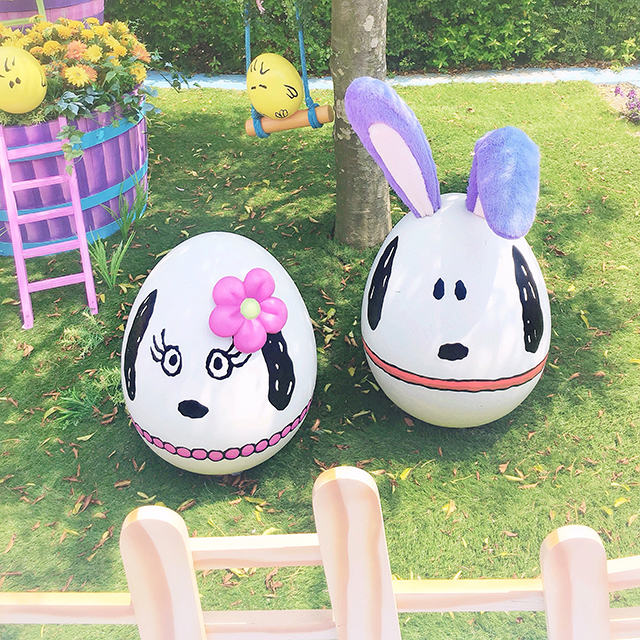 We are very curious to know what happened to Mamoru! 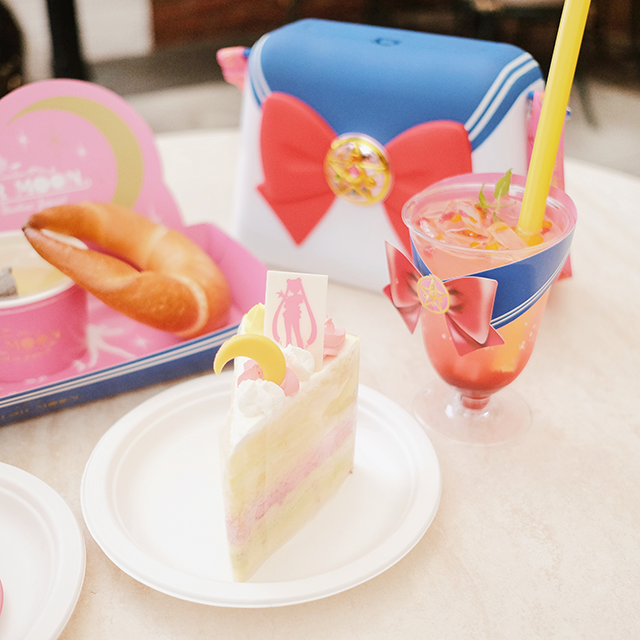 Many of you asked us about these Sailor Moon bags when we posted it on our Instagram, so they are actually POPCORN BAGS! Correction, they are the CUTEST popcorn bags! You can buy them (along with the popcorn) at this stall in front of the cinema. 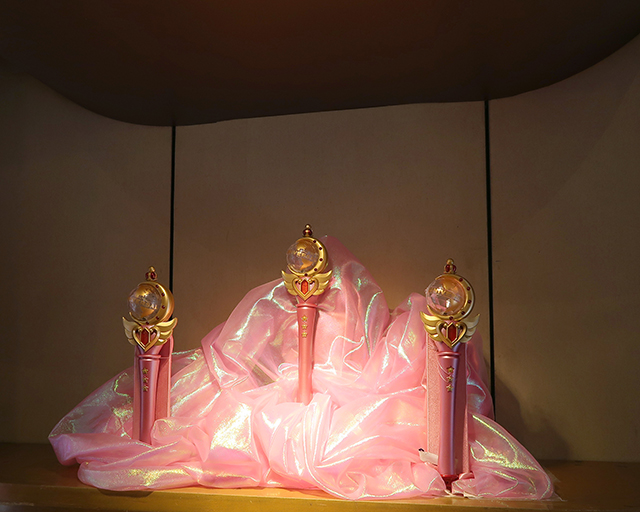 There’s also a Sailor Moon shop adjoining the cinema where you can buy a lot of merchandises like sailor wands (not only Sailor Moon’s), hair accessories, makeup, clothes, etc. If you’re tired of the attractions, you can simply stroll through the park and enjoy the beautiful scenery, decorations, and unique costumes! 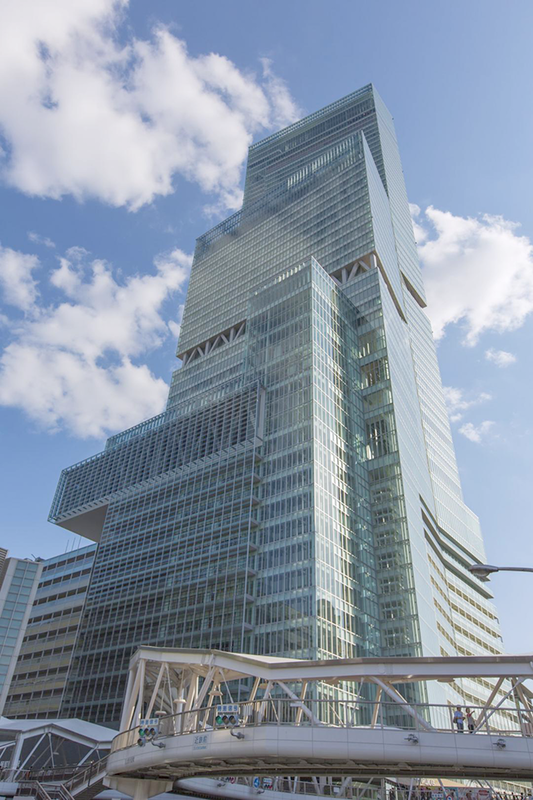 Our next day in Osaka, first thing in the morning we went to Harukas 300 Observatory, which happens to be THE TALLEST BUILDING IN JAPAN!! 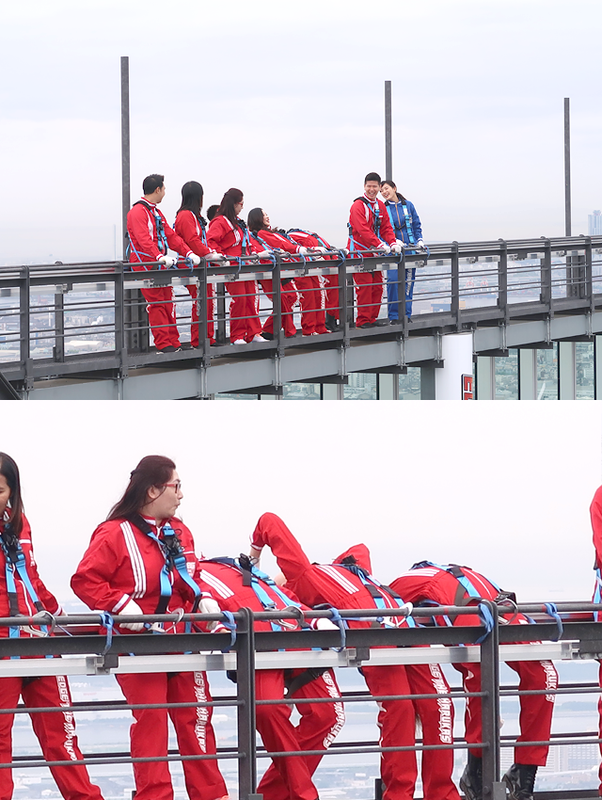 After that, we jumped to those rocking red suits, and climbed up the ⚡️ stairs, heading toward the edge of the building. 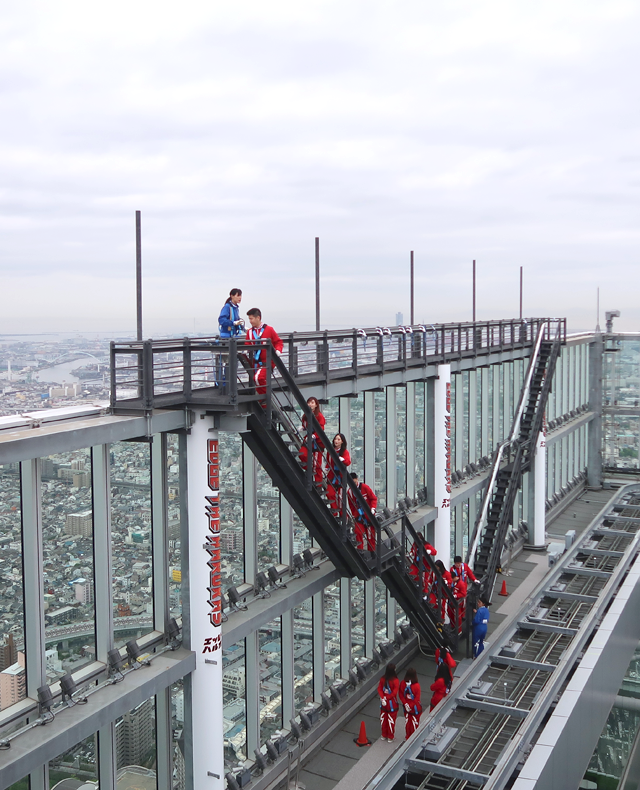 The guides -the ones in the blue suits- explained to us about the building and the attraction, while making sure that all the safety procedures are done (making sure our harnesses are attached to the safety rail, etc.). HELL YEAH WE LEANED OVER UPSIDE DOWN WITH OUR HANDS DANGLING WOOHOO!! 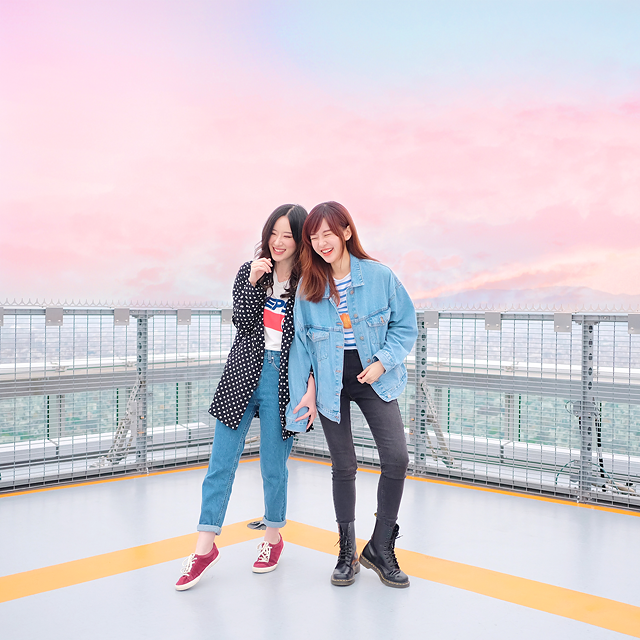 ..which is basically a wide rooftop space where you can enjoy the view and take giggly photos like this. 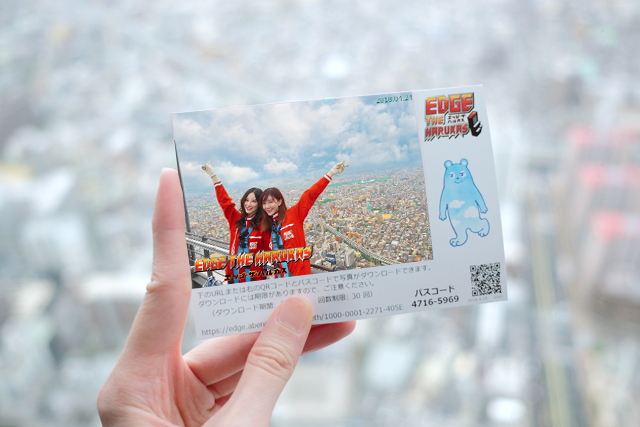 The cute souvenir photo that you can take home! That zen blue cloudy bear is named Abenobea, by the way, and he is the cute icon of Harukas 300. Now this one- how to say this? Both of us love animals, we’re a fan of them. We grew up with a lot of pets: fishes, turtles, chickens, dogs, rabbits, and now cats. When we were smaller and our parents didn’t let us keep a pet yet, we’d even beg them to take us to pet shops, where we can at least get up-close and personal with the animals, with a chance to even pet them if we’re lucky. Our infatuation with animals doesn’t diminish as we get older, it just grows. 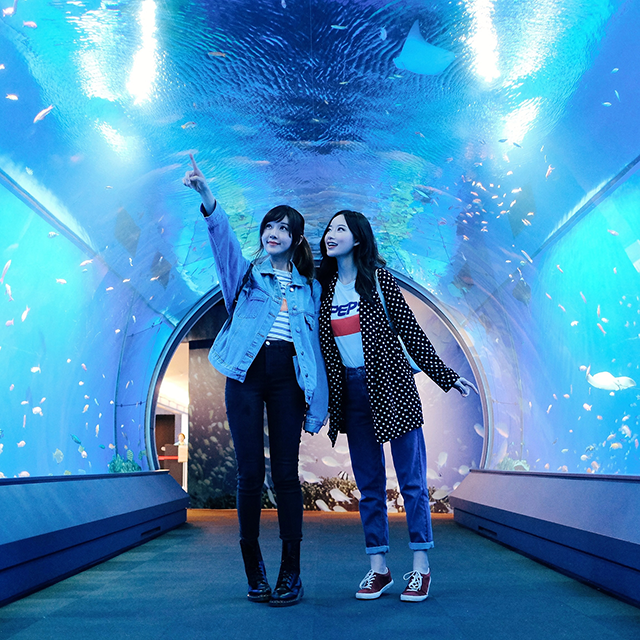 So naturally, whenever we travel and there is this zoo or that aquarium, we’d try our best to visit them! 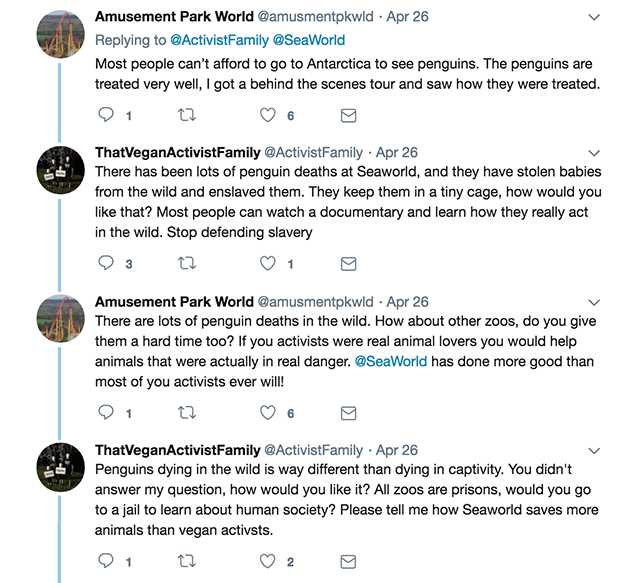 But, with increasing amount of informations we get about animals in captivity, our joyous little visits to these places feel more and more like a guilty pleasure, instead of being a pure pleasure like it once was. Simply put, we are absolutely happy to meet these animals, but are they happy to meet us humans? 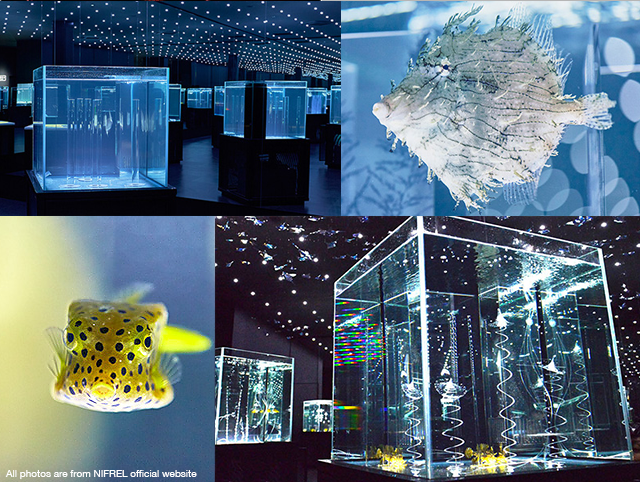 And that was the exact dilemmatic feeling we went through during our visit to Nifrel, an “interactive aquazoo which houses 2,000 animals of 150 kinds, and is artistically designed to highlight the individuality of each creature, using a combination of construction, lighting, music and screen images.” (quoted from www.nifrel.jp/en). 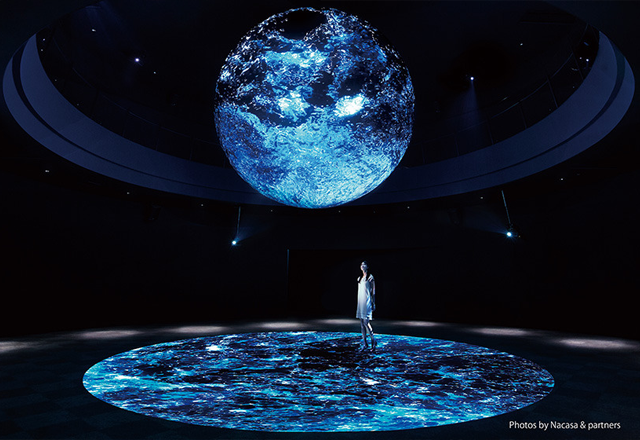 There’s also this ‘Wonder Moments’ room, which is “an interactive art experience delivered to you via a round light installation, which has been created by Artist Takahiro Matsuo. You will be taken to a mysterious world which could give you a sense of viewing the earth and other stars and planets from space. The spherical body portrays various scenes from nature, including water sculptures, flowers and trees, as well as the universe, with a shower of light being poured over you”. Really wish we had more time to spend in this magical installation (that day’s schedule was pretty packed), but for now, let us just immerse ourselves in this Youtube video of it. We were totally fascinated by the otherworldly charm of this place UNTIL we reached the ‘Waterside’ section, which showcases MUCH bigger animals such as a pig-nosed turtle, a white tiger, a pygmy hippopotamus, and a saltwater crocodile, which are definitely more intelligent and has more self-awareness than the fishes or the other small creatures in the ‘Colors’ or ‘Shapes’ section. First of all, each of them are alone, meaning that they don’t even have one friend of the same species like the other creatures in Nifrel, these four guys are just- well, alone. 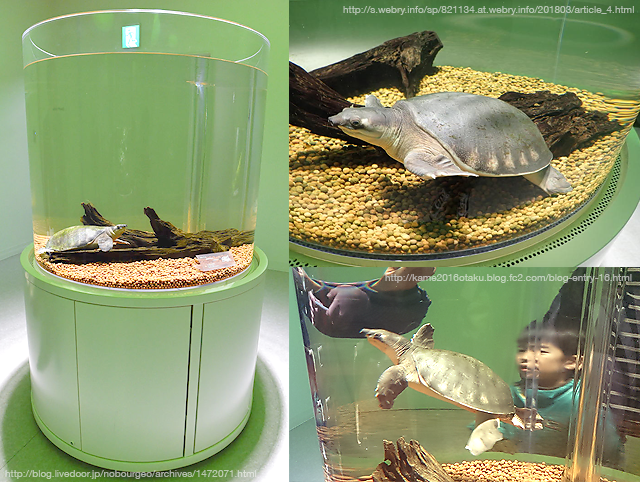 Second of all, each of these animals are given the largest spaces here in Nifrel (except for the turtle, whose tank is the same size with the other smaller critters in the ‘Waterside’ area), but even so, these spaces are just too small for these big guys. Take the pig-nosed turtle for example. 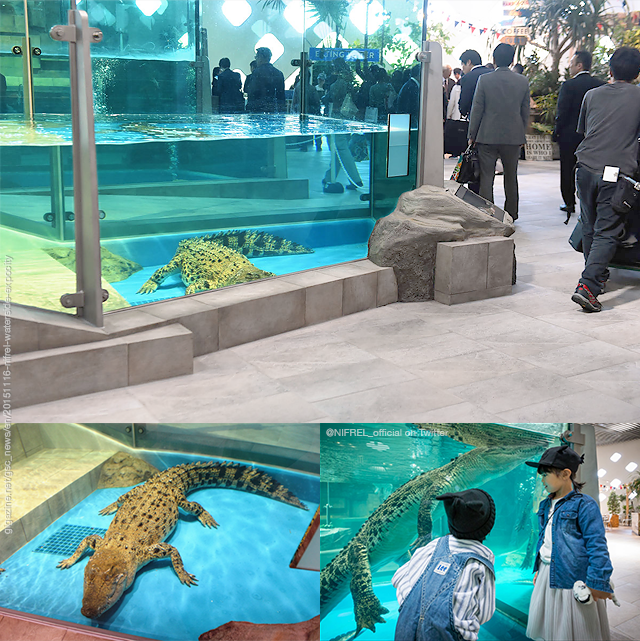 Here, his tank is just about 1 meter deep, while in nature, this cutie usually inhabits rivers up to seven metres deep. Now the saltwater crocodile. Averagely 5-7 meters long in the nature, they are known as excellent swimmers and have often been spotted far out at sea. Here in Nifrel, the enclosure isn’t even big enough as human swimming pool, and yet it’s as empty as human swimming pool, unlike their natural habitat at all. And finally, there’s the ‘Behaviour’ section, where we can interact super duper closely with the animals there. 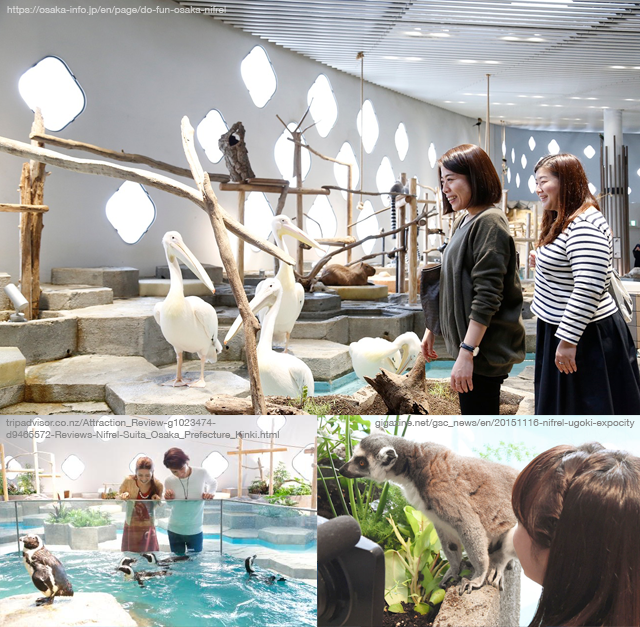 We got so excited when we entered the room because there were these victoria crowned pigeons and ring-tailed lemurs which casually ran around us! There are also many other cute animals and most of them are uncaged except for the otters!! 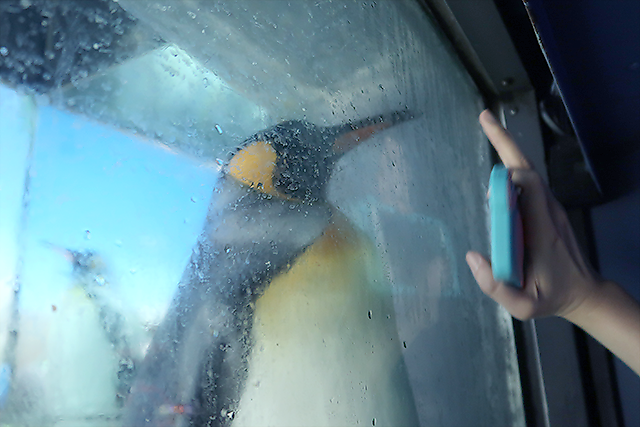 In the video, there were only one penguin, but when we were there, there were about four to five penguins who kept swimming hard like that, banging their beaks against the glass wall, as if they’re trying to get out of there. We asked three staffs there, who all answered similarly. 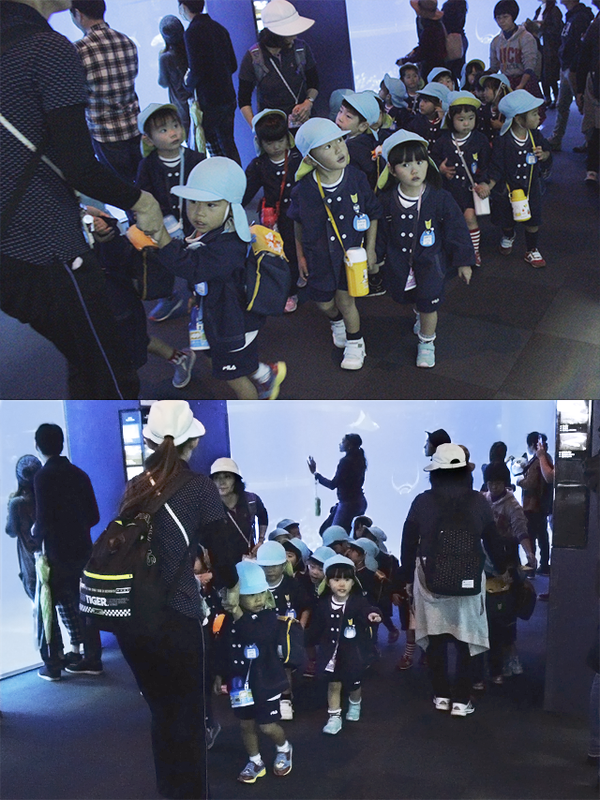 They said, “Oh, they (the penguins) love to dive deep, but since their body is too light, they use their beak against the wall to help them reach deeper into the water”. Well, let’s hope it’s true, then. 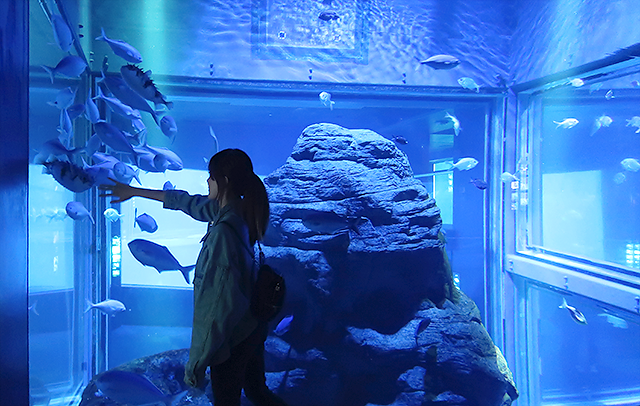 Our last visit of the day was to this magical place filled with marine life. 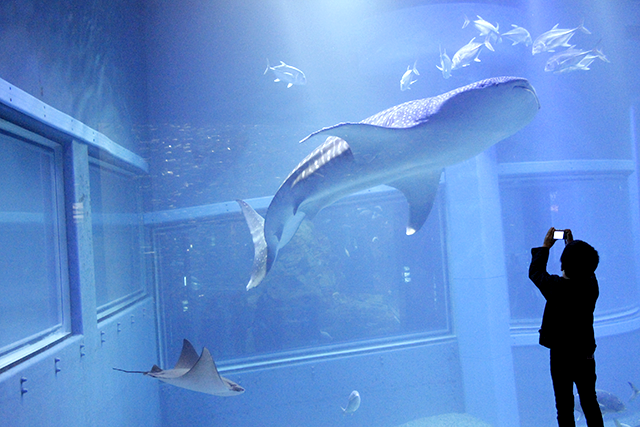 Just like what we said up there, it’s always a pleasure for us to meet animals up close. 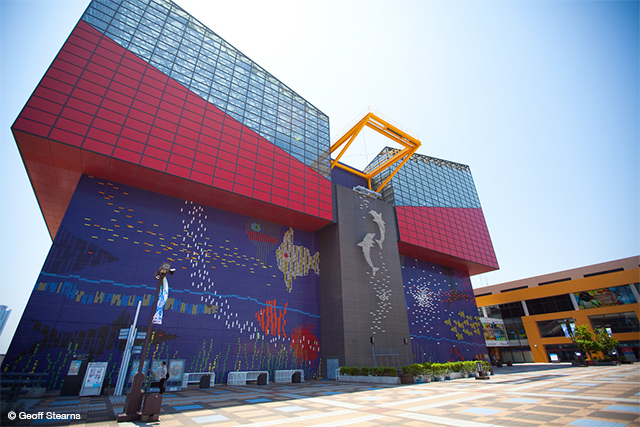 Unlike Nifrel, the tanks here are much, MUCH bigger, that even though it was completed in 1990, today in 2018, it’s still number 6 out of 10 largest aquariums in the world. The size of the massive main tank really impressed us. We literally had to spiral our way down from the 8th floor entryway to get to the bottom of this 9 x 34 meters tank. 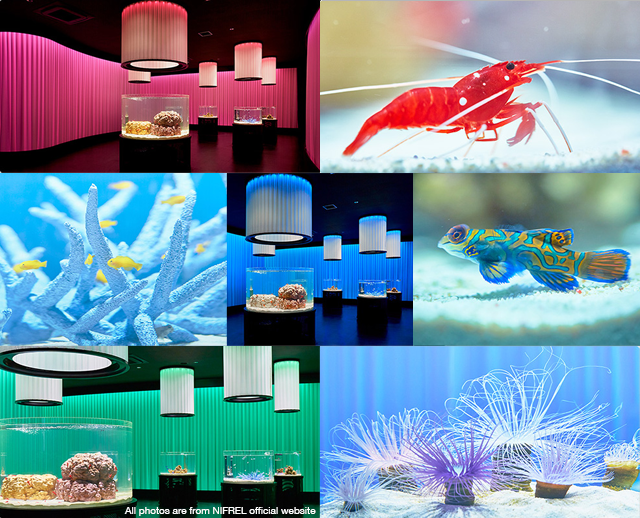 Looking around, it made us feel like we’re going underwater with these ocean friends! There are a wide variety of marine creatures and all of them seemed well cared for, but still.. *sigh* just like what we said about Nifrel, now every time we see some bigger, more intelligent animals in captivity such as (and especially) the dolphins and whale shark, we can’t help but feel sad for them. ? 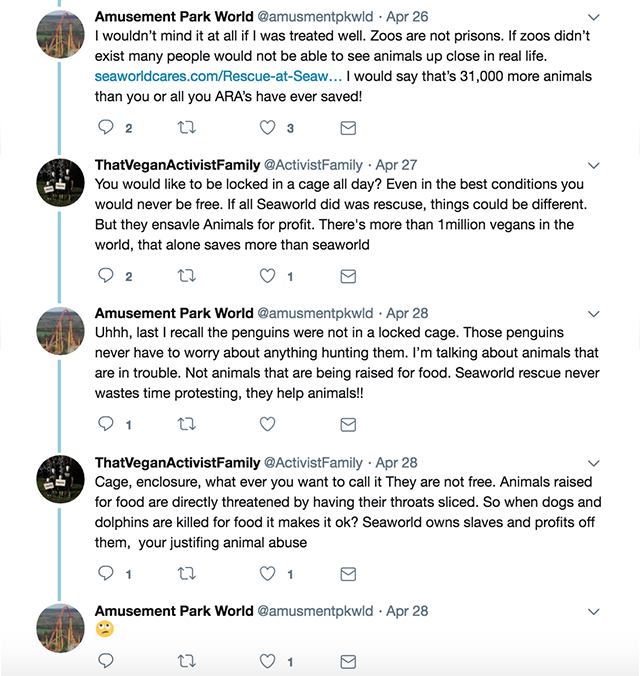 If you’ve watched the movie Blackfish, which we really recommend you to do so if you haven’t already, you’d totally understand what we’re talking about. It’s always a fascinating and exciting experience for us to see and observe these beauties up close, but deep down we also know that they would live a happier, healthier and longer life in their own home, the sea. GUILTY PLEASURE MIXED FEELINGS TO THE MAX!!! 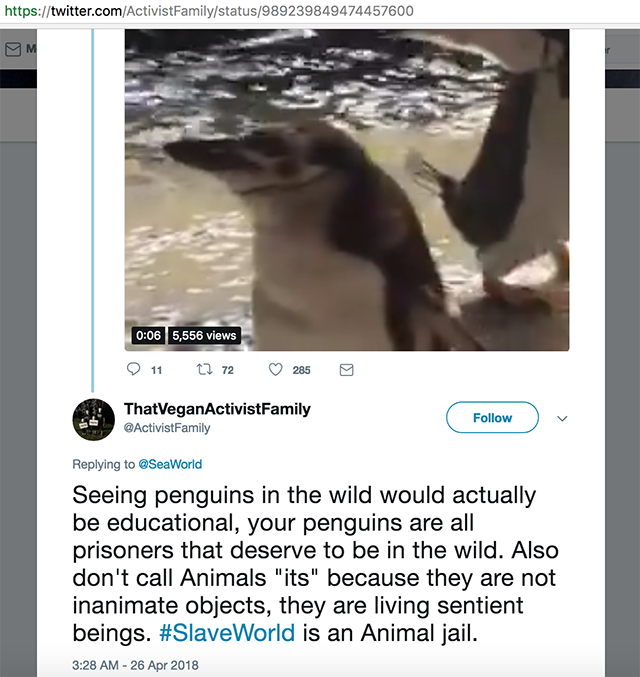 These guys remind me of Mumble, if you remember that awkward penguin in the movie Happy Feet, who accidentally got captured and put in a zoo? ? 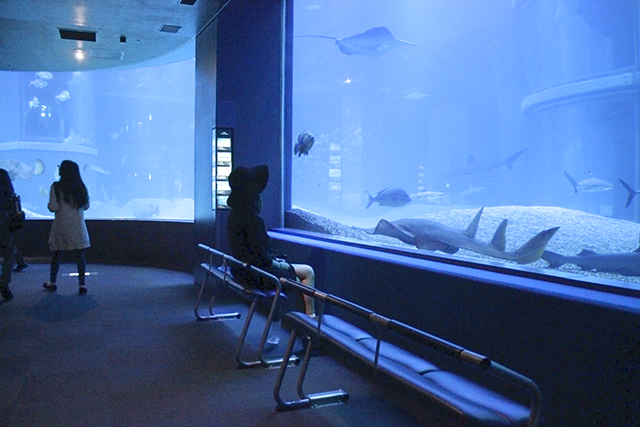 All around the place, there are many parents pointing at the various creatures, telling their kids about them, and the kids would press their cheeks against the glass, looking astonished and seemingly very eager to learn about these fascinating friends from the sea. Honestly, we feel like these kids too! 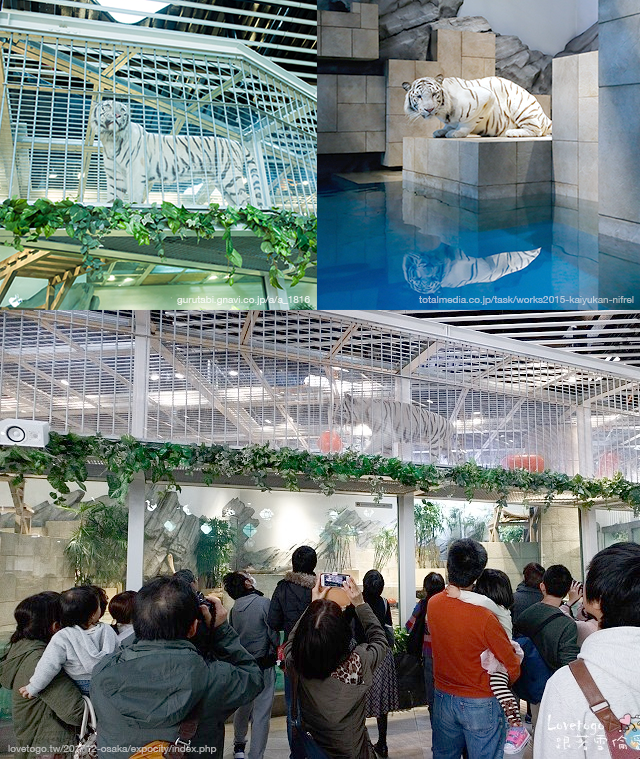 But then again, it is a few hours of entertainment for us, but a lifetime of captivity for these animals. ?? Soaking in the serene, relaxing ambience at the bottom of the tank. 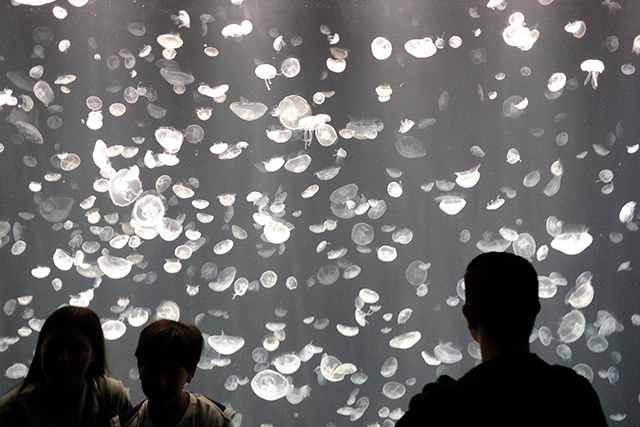 The jellyfish exhibition was one of our most favorite parts in this aquarium. The beauty of their movements and transparency created this sense of peaceful elation inside us. And again, it’s because seeing jellyfishes in a tank like this (and many other small creatures that aren’t as intelligent nor self-aware as the larger ones) don’t make us feel morally depressed. 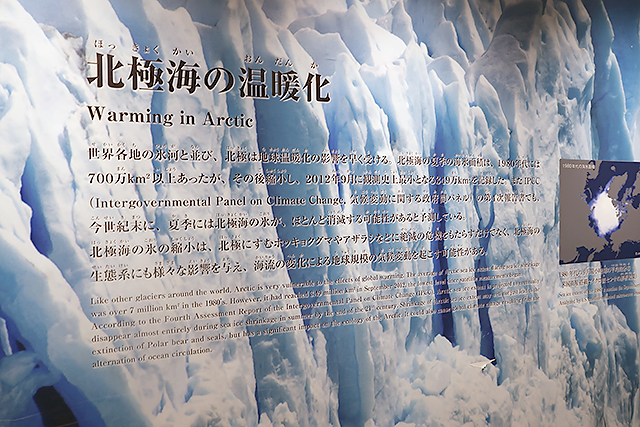 Ethical issues aside, we have to admit that Kaiyukan is a great and interesting place to learn about marine life, because not only we can observe these beautiful living creatures in person, they also put these informative and interesting texts about each creatures, the environment they live in, a bit of facts and history behind this and that, and more. 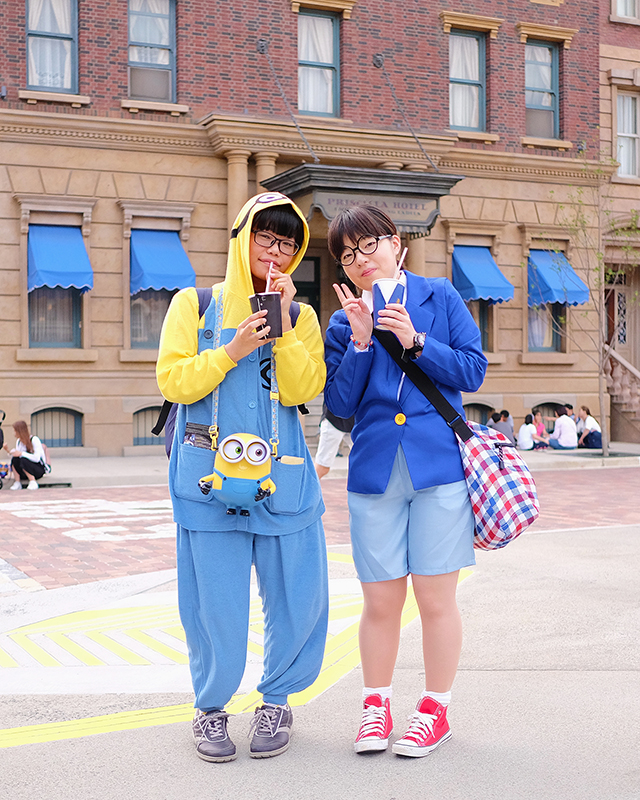 Gonna end this long, emotional post with this one happy picture of us in USJ to lighten up the mood. Thank you so much for reading and see you guys on our next post!